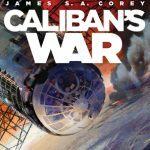 So the title was a bit confusing to me because Caliban is never once mentioned in the book „Caliban‘s War“ – it is helpful to look up who Caliban is. He‘s a character from The Tempest. A malformed, mottled man, half-human, half-devil. The book starts out with a disconnect from the previous one. Some time has passed since the protomolecule and Eros crashed into Venus. Mars and Earth are gathered in a stand-off around Ganymede because of it‘s importance in growing food for the belt. We‘re introduced to a new character Bobby, a Martian marine who becomes an integral part of this books plot right from the start. In the meantime Holden and crew have been working for Fred as privateers… with Holden apparently turning into an Ersatz-Miller. On Earth, Avasarala gets a lot of screen time and since I like her so much, I was suffering quite a bit when all the intrigues surrounding her came to light. And of course the protomolecule makes more appearances.